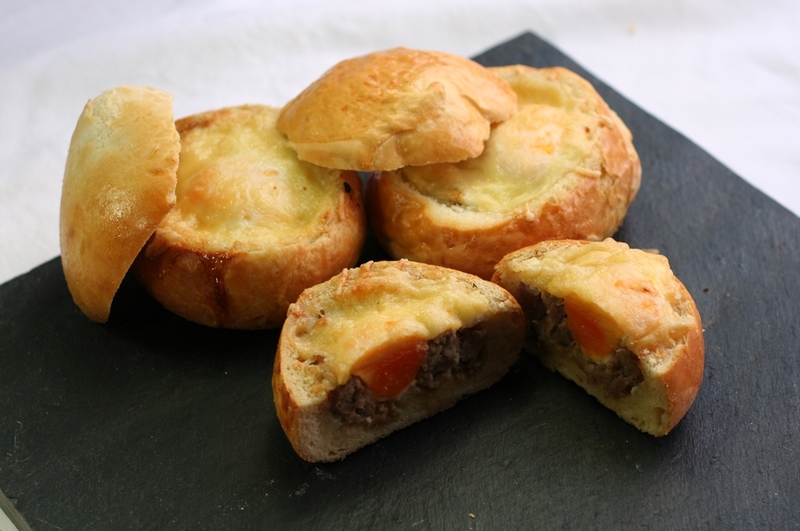 Some time ago, the question “When were sausage rolls invented?” popped into my head, and so I decided to mount a culinary expdition to try and find the earliest recipe for these popular snacks. So I set off on my recipe hunt and found that, although the earliest sausage roll recipe that I could find dated as far back as 1828, the recipe I found most interesting was one by Charles Elmé Francatelli, published in 1852. Although something of a celebrity chef to high society in London, as well as (briefly) being chef to Queen Victoria, Francatelli was considered to be a culinary economist. He was often quoted as saying that he could feed a thousand families on the food wasted in London in one day. Francatelli’s book “A Plain Cookery Book For The Working Classes” offered simple and wholesome recipes for those less well off. 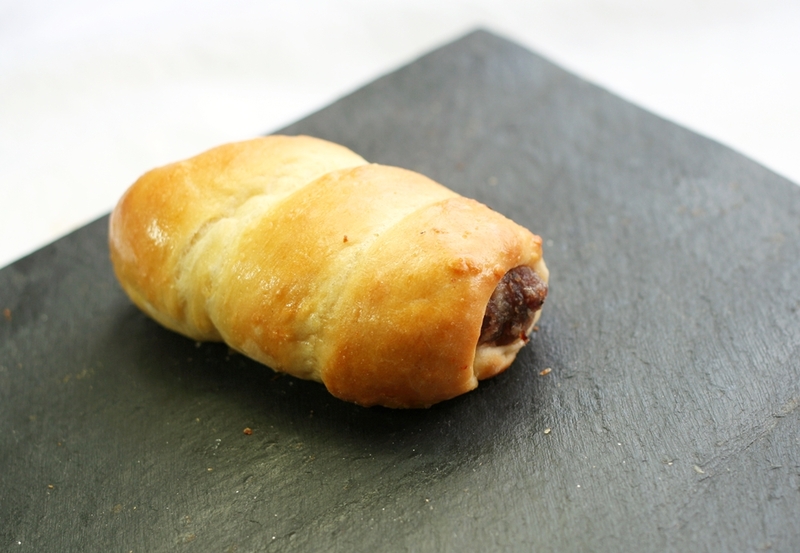 Francatelli’s sausage roll was made using a bread dough enriched with either butter, dripping or suet instead of pastry. A sausage inna bun! And those of you who are familiar with the Discworld novels of Terry Pratchett will know that these are the fall-back sales item for C.M.O.T.Dibbler when his get-rich-quick schemes invariably go pants down. I also like this idea because, even with Francatelli’s enriched bread dough, it would be much lower in fat than pastry, and much more satisfying. I tried the variations suggested, and, I’ve got to be honest, the suet pastry wasn’t very pleasant to eat cold. It was a bit funky (to my tastes) eaten warm, too. So my suggestion is to either use butter or beef dripping, especially if the sausages are made of beef. Alternatively, you can use a regular bread dough mixed with either all milk or half milk and half water, to give a softer, billowy crumb and crust. Having said all that, I’m not going to be giving a recipe for either bread dough or sausage mix. What I’ve got for you today are some suggestions as to how you could make deliciously unusual savoury snacks using little more than these two simple items. Using bread dough in much the same manner as you would pastry, you can easily ring the changes and keep this snack food both tasty and interesting. Each of these variations either use white bread dough, risen and knocked back after the first rise or bread rolls. 1. Plain bread dough sausage roll. Roll some bread dough out to a thickness of about 1.5cm. Brush the surface of the dough with water to encourage the sausage meat to stick. 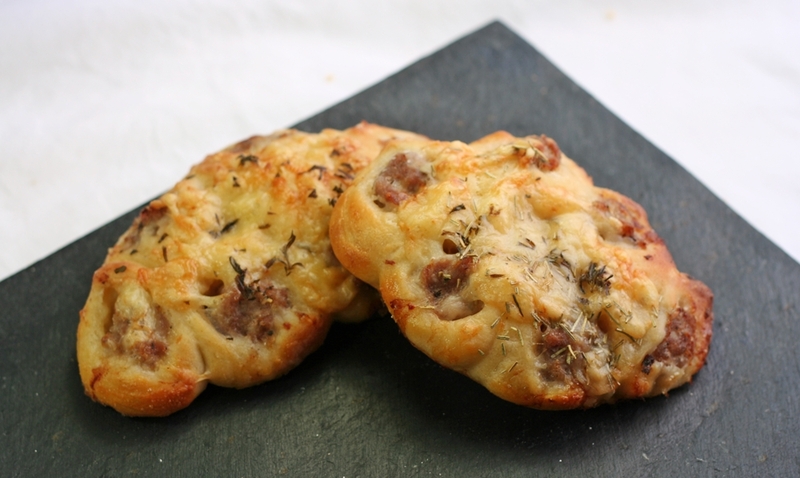 Remove the skin of the sausages and roll them in the dough, pinching the edges together . Cut slashes along the top of the dough and brush with beaten egg. While the dough is rising, preheat the oven to 200°C, 180°C Fan. Bake for 15-18 minutes until both the dough and sausage are cooked and golden. Remove the skin of the sausages. Cut the dough into strips 3cm wide. Take one strip and wind it around the sausage, making sure both ends finish underneath. Brush the dough with beaten egg and bake for 15-18 minutes until both the dough and sausage are cooked and golden. Proceed initially as for the plain sausage roll. Once the sausage has been wrapped in dough, brush the outsides with water and slice it into six pieces. Arrange the slices of dough-wrapped sausage as per the diagram above. The water will help the dough stick together. Sprinkle a little grated cheese and chopped herbs (parsley/thyme/rosemary/savoury) over the top and set aside to rise. There are two versions for these open pies, small, circular pies and larger, oval pies. Both are made with sliced, cooked sausages – ideal Déjà Food suggestions! Roll some dough out to a thickness of about 1.5cm. Brush the surface of the dough with water to encourage the dough for the sides to stick. Using a plain circle pastry cutter of whatever size you fancy, cut out the bases for the pies and place on a parchment-lined baking tray. Cut some strips of dough and roll them into ropes, then coiled them around the edge of the bases, as if making a coil pot. Use a few more dabs of water to ensure the dough sticks together. 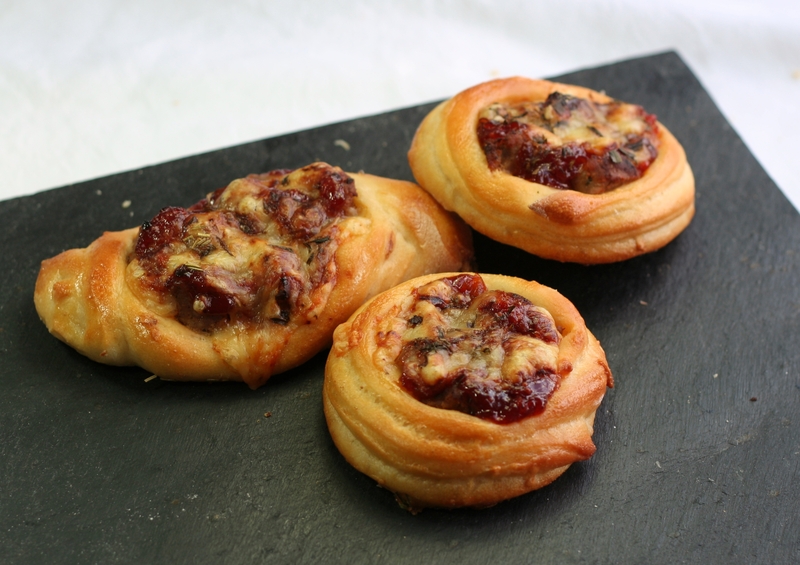 You only need 2 or 3 coils of dough to make the sides. Add the filling now – so that the dough can rise around it and (hopefully) hug it all together. Put slices of cooked sausage in the bottom of the pie. Add 1-2tsp spicy sauce, brown sauce or chutney on top. I used Sainsbury’s Basics Tomato chutney left over from the Cheese and Potato Pies. Sprinkle some grated cheese over the top and set aside to rise. Brush the dough with beaten egg and bake for 12-15 minutes until the dough is cooked and golden and the filling hot. Shape some dough into a ball, then roll it out to an elongated oval shape. Dampen the edges with some water. Arrange the filling along the middle of the dough as above (sausage/sauce/cheese). Fold one long side of the dough up and around the filling. Fold the other side around the filling too, and pinch the ends together. Tuck any extra dough at the ends underneath, to prevent the sides of the pie unravelling. I’ve called this a Breakfast Bun, but they are delicious at any time of the day! This is a little different to the other recipes in that it uses cooked bread rolls, rather than the raw dough, so also super quick if you have ready-made rolls. These rolls also use sliced, cooked sausage. Slice off the top of the buns and scoop out the crumb, leaving a wall of crust/crumb about 1.5cm thick. Whizz the crumb in a food processor and freeze the breadcrumbs for another use. Add the filling – I just used sausage, egg and cheese – but it occurred to me afterwards that these rolls might be improved with some sauce/chutney/salsa – you decide. Add sauce to the bottom of the roll if liked, then arrange a layer of sliced, cooked sausage over the top. Crack a raw egg over the sausage. Bake on a parchment-lined baking sheet for 20-35 minutes. If you’re eating these roll straight from the oven, you might like to have the yolk of the egg still runny. If baking them for consumption later, I’d recommend cooking for the full 35 minutes, so that the yolk is cooked solid. If you want to crisp up the tops, add them to the baking sheet for the last 10 minutes. I’d be really interested to learn of an earlier recipe – do let me know! A treatise on the art of baking, with a preliminary introduction, shewing the various productions… with a number of valuable receipts, original and selected for the baker and domestic circle, (1828), John White, Anderson and Bryce, Edinburgh. My husband will love me forever if I bake him any one of those items. the ultimate pig in a blanket, nice! You are without doubt …………… amazing, entertaining, talented (without question) and fun. made these and went down a real treat! !